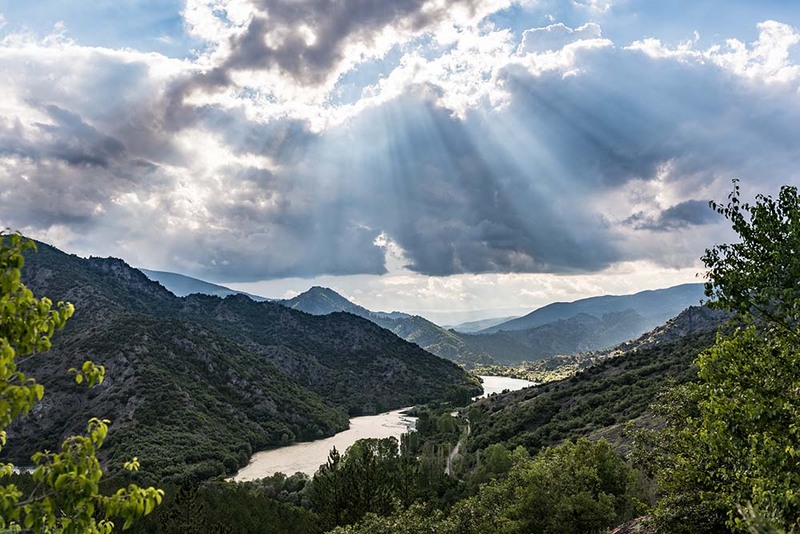 As one moves from the West to the East across Turkey, the geography escalates, and northern Turkey in particular offers great variations in topography. The sun shows itself only rarely in this rainy region, where it proves almost impossible to light a fire, even with the help of an accelerant like gasoline. However, untouched nature and life on the mountains impresses visitors. 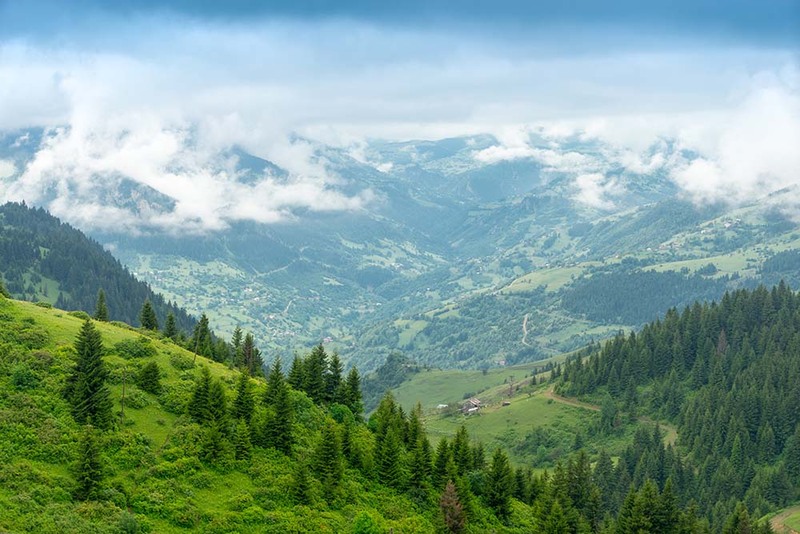 While experiencing the thousand different shades of green, you may discover the traditional cultures in the Black Sea Mountains, which are divided into three categories: West Black Sea Region, Middle Black Sea Region, and the hilly East Black Sea Region. Düzce used to be a town of Bolu, prior to it becoming an independent city. 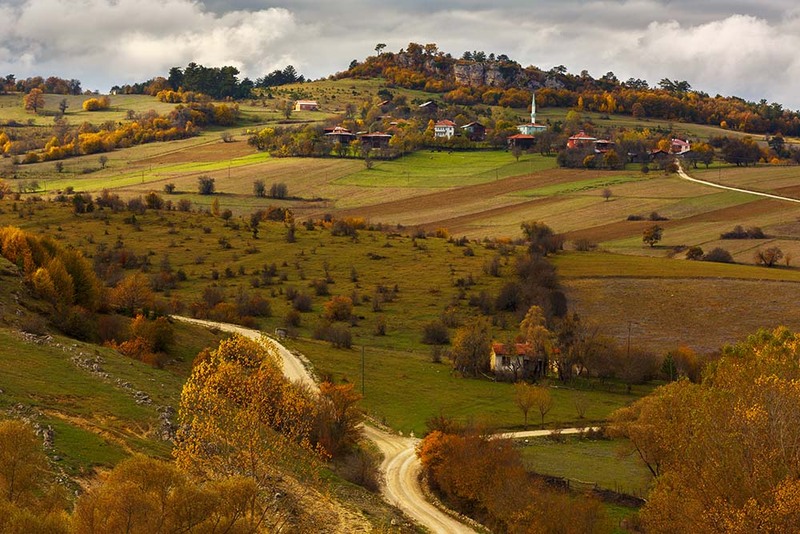 Duzce became popular in the Western Black Sea Region as the only ancient settlement in the area’s history. In terms of extreme sports, Düzce is appealing, rich in natural landscapes like the Samandere and the Güzeldere Waterfalls, which attract many weekend visitors from both Istanbul and Ankara. 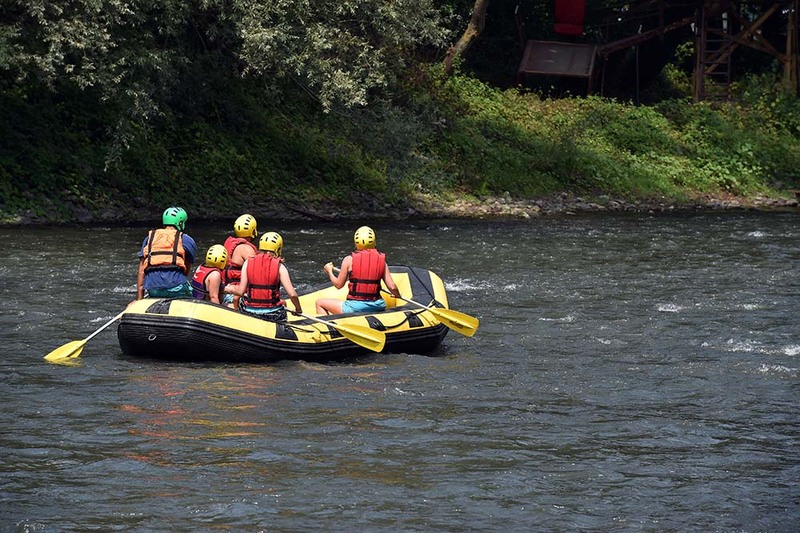 In addition, the adrenaline addicted may spend their time rafting on the Melen River. Another town of Düzce, Akcakoca, has been made famous by its clean coastline and because the Genoese Castle is located there. Düzce is also situated on the one of the most active geologic regions in Turkey, and Derdin Baths attracts many tourists from around the globe, with water believed to be beneficial for the body. Right next to Düzce is Bolu, which draws attention through its national parks and lakes. Visitors love the gorgeous, verdant mountains. Some might be shocked when stopping by Yedigoller National Park because of the crowds at the lakes located inside the Park. The most important point to remember is that there is no restaurant inside the national park: be aware that you will be a bit removed from civilization for a while! Lake Abant and Nature Park are located near Gölcük Park and all 3 are points of interest that you should note when in Bolu. Paragliding is becoming more and more popular every day in Abant as well. Due to its popularity for mountain and winter tourism, Kartalkaya is unique: there are high-quality services there, and it’s an accessible facility. Finally, besides a reputation for nature, you can visit Göynük and Mudurnu to discover the old Turkish culture and take in the cultural side of Bolu. A thorough tour of historical residences as well as historical bazaars, where tourists can buy food, drinks, and locally made crafts, and all of this can be completed in one day. While moving from the West Black Sea Region to the East Black Sea Region, you’ll likely note the increase of both rainy weather and the number of shades of green on the mountains. The emigrant cities used to be important in agriculture; however, farms have by now been invaded by forests, as local people are immigrating to other metropolitan cities and further on to Europe. However, these forests also include a few centuries-old trees such as Fetih Trees in Zonguldak that were planted by Mehmet the Conqueror. Kapuz Beach is a rather popular spot in Zonguldak during the summer as well. Safranbolu, located in Karabük where accommodations on average are offered in 250-year-old Ottoman houses, is another valuable experience to discover. The town was accepted to the UNESCO World Heritage List in 1994, boasting 200-year old houses that are the living representations of Ottoman architecture. The name of Safranbolu derives from the town’s most important agricultural product, saffron, and daily life in Safranbolu might be considered as a living profile of Ottoman heritage. Besides, the town presents a magnificent view! From the ancient bazaar to Hızırlık Peak, the vista makes a person feel that he or she is has traveled back in time. To avoid limiting the view from other houses, the buildings were built on the back side of the valley, and the entrances of houses interact with others’ roofs. 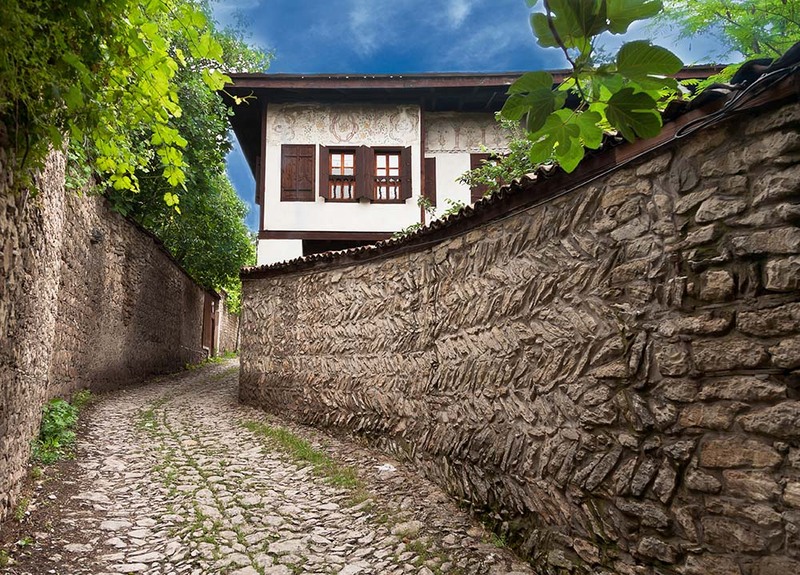 Traditional Ottoman house in Safranbolu. During a trip to Safranbolu, Mencilis Cave, Tokatlı Canyon and its observation terrace, and İncekaya Aqueducts are other places that must be included on your list. Caves are transformed into touristic attractions, so while you walk through the area you may sense the mystical flavor of history. In addition to Safranbolu, visit Amasra, which connects Karabük to the sea. It is another place that attracts many people from Europe, especially in the summer. The Castle and the Peninsula, which can be reached by another aqueduct, should be visited in this most typical coastal town. Black Sea on a Calm Day, Cakraz Beach at Amasra, Kastamonu. Kastamonu is the one of the most pleasurable places both due to its nature and its culture. The town that has become popular in folk songs, Pinarbasi, is indeed a natural wonder. Ilıca Village and Ilıca Waterfall in this peaceful place help relieve tension, and just a few kilometers from Ilıca is the Valla Canyon, which is notable as the fourth deepest canyon in the world; only visit if you don’t have a fear of heights! All these tourist attractions are located in the Kure Mountains National Park. Landscape beautiful autumn nature on the hillside of Kure Mountains in Kastamonu. Gideros Bay and its nature in Kastamonu, located in Cide, charms you while it also serves as the home for many ships. 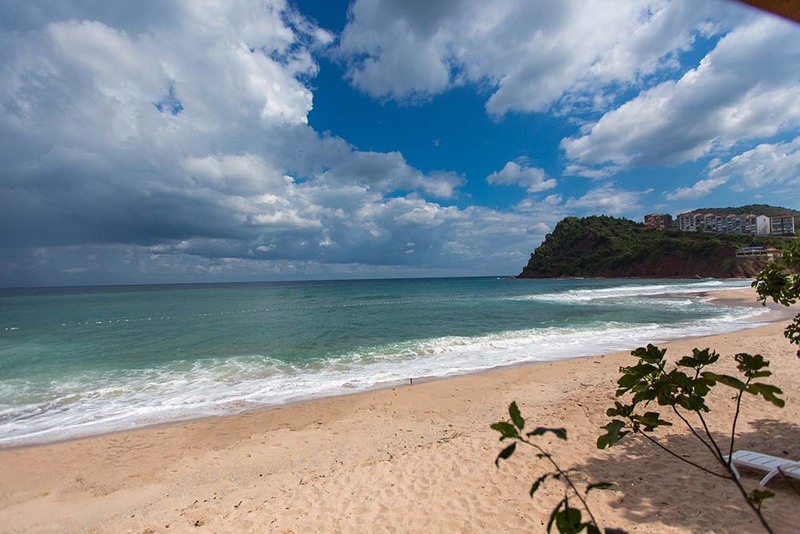 You are allowed to swim in the beautiful Black Sea Bay. The city center in Kastamonu also hosts many cultural attractions. The tomb of Islamic thinker Saban-i Veli is located there. A sweet water flows from the fountain that is near to the tomb and you can enjoy a drink. Kastamonu houses are rare existing examples of Ottoman wood and stone art. You can also drop by Kastamonu Castle and the Clock Tower in the center. The most northern point of Turkey might be found in Sinop located in the Middle Black Sea Region. Sinop has a natural harbor (thanks to nature) and Hamsilos Bay and Hamsilos Fjords are nice places to visit. Historians claim that the city was constructed by the daughter of the God of Rivers and its name used to be Sinope. A stop in Erfelek Waterfall and hot springs might help you relax here. 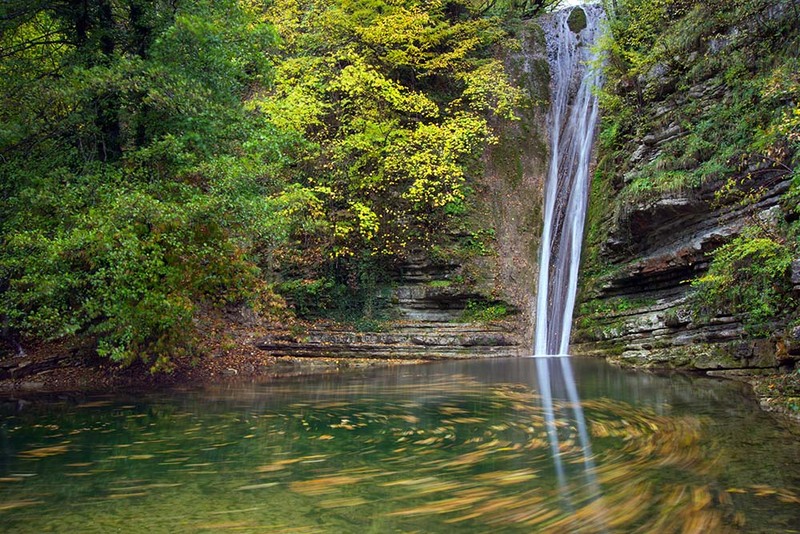 Erfelek waterfall in Erfelek district of Sinop province,Turkey. Long exposed image. The bridge between the Black Sea and the Anatolia regions is the coastal city of Samsun. It is where the Turkish War of Independence began. Across history, Samsun hosted many civilizations, including Amazonians. Samsun’s nature is pretty productive and its soil is fertile since both the Yesilirmak and Kizilirmak stream through, taking the shape of river deltas in the Black Sea. Through the coast, the city can be considered as two parts: Eastpark and Westpark. You can make a trip in the coastal region by using the ferry. Tracking along the streams makes it possible to discover the beauty onshore. On the Amisos peak, you can rest and have some peaceful time with the scenery. It is an absolute privilege to watch the sunset in the Yakakent Harbour. You should also visit Kızılırmak River Delta and Bird Sanctuary, located in Bafra’s indigenous, unaffected environment. Wetlands in the Kizilirmak delta Black Sea Province of Turkey. Across time, the Byzantines, Persians, Mongolians, and the Seljuks made their way through Tokat, and the city can be observed from the Tokat Castle, located 750 meters above the city on the Hisartepe. It is possible to feel the spring breezes in this city surrounded by natural beauties and fertile soils—a place mentioned in the diaries of Evliya Celebi. On the most popular street of Tokat, Hıdırlık-Yesilirmak bridge is of Ottoman heritage. The bridges constructed on the rivers are pleasing to the eyes. The triangle between the historical Behzat area, the Clock Tower, and the city square offer a different and peaceful taste of Tokat. In the bazaar area, old buildings represent the spirit of the city. Niksar and its natural mineral water, as well as Erbaa with its plateaus, are other places worth visiting. Ordu is one of the pearls of the Black Sea and the city is also important for the world’s hazelnut production. The range of tourism is wide: Ordu hosts many global tourists and provides them unforgettable memories via coastal and highland vantage points, plus activities like hiking and paragliding. From its green peaks, it is possible to observe the beautiful green landscape of the entire Black Sea region. In Boztepe, watching paragliders—and actually paragliding—are enjoyable, and Boztepe is easily accessible via cable car. The Black Sea Region hosts many streams which pass through several cities; some of these waterways are mentioned in folk songs of the region. The rivers of the Ordu, and next to them the Sis Mountain in Giresun, are examples of these inspirational places. Near Sis Mountain, Transhumence (which is going to the mountain highlands during summer months and living off the land) is still popular. Many local hostels are still in business there. Foggy Plateau Highland with Giresun. Giresun is also known as hazelnut and cherry country—the only one in the Black Sea Region. It was built on a peninsula between two valleys stretching through to the sea. The name Giresun derived from the cherry sources important throughout the city’s history. The most popular cities, Trabzon, Rize, and Artvin in the Eastern Black Sea Region are the greatest touristic attractions. If you have only limited time, travel the natural scenery here, but it’s strongly suggested to visit these cities slowly while enjoying the harmony of green. 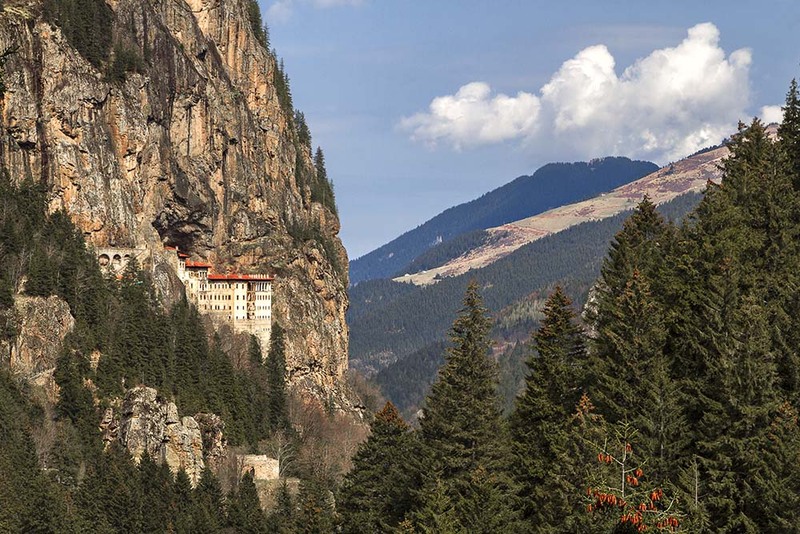 Sümela Monastery is the most popular historical attraction in Trabzon. The builders of the Monastery, two priests, saw Jesus and the Virgin Mary in their dreams and dedicated the Monastery to them. The Eastern Black Sea Region hosted the Pontus Empire thus you will notice the similarities between the Greek and Turkish Black Sea dialects. Sumela Monastery in Trabzon, Turkey. Greek Orthodox Monastery of Sumela was founded in the 4th century. One of the famous natural attraction of Trabzon, Uzungol is an adorable town surrounded with tall, stormy mountains. While watching the lake in Uzungol, you might relax so much that time seems to stop, but you can then head to Bayburt via one of the most dangerous tracks in the world from Uzungol. You must have an off-road vehicle to pass across the 3 meters of snowy walls on this path, even in the summer. If you have a tight schedule, you may go and sit in a cafe in Boztepe to watch all of this excitement. In this same region, Zigana, which connects Gumushane to Trabzon, is a town with an active winter sports culture. Uzungol (Long Lake)_One of the most beautiful tourist places in Turkey. The mountain valley with a trout lake and a small village in Trabzon. 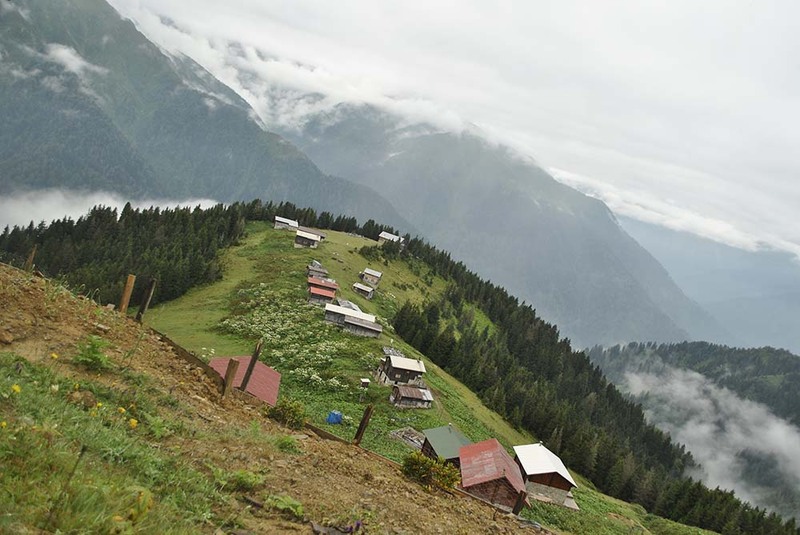 Rize, a close neighbor of Trabzon, catches visitors’ attention with its plateaus. Ayder is transforming into a small town from an untouched plateau, especially with the help of winter tourism. You can reach the entrance of the Kackar Mountains National Park, Kavron plateau, if you make your way to the upper side. 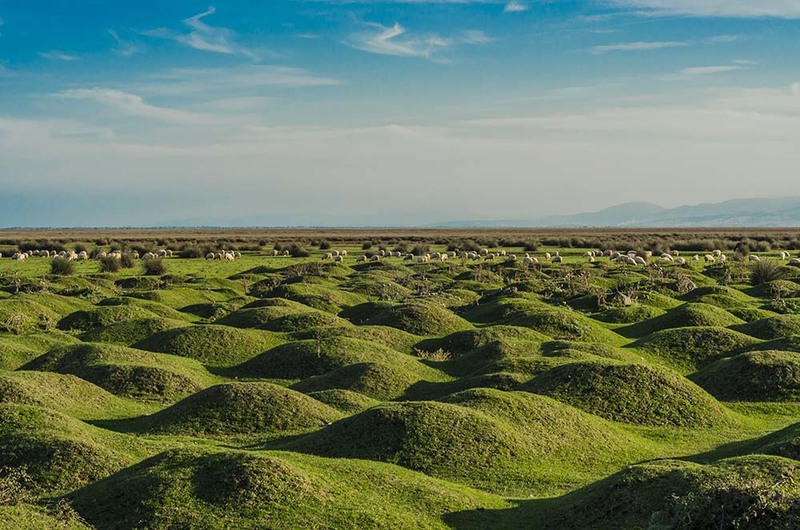 Without climbing to the Ayder plateau, you can visit Zilkale on the Cicekliyayla plateau and then make your way through the Elevit and Palovit plateaus. The important point about this route is first that these plateaus require good hiking abilities and the second is that you should not climb the Kackar Mountains if you don’t have any prior experience. The historical bridges constructed on rivers in the region present beautiful photo opportunities. Landscape view of Kackar Mountains or simply Kackars, in Turkish Kackar Daglari or Kackarlar located in Rize. The most eastern part of the Black Sea Region, Artvin, appeals to the spirit with its emerald green tones and even a few centuries-old bridges, churches, and other buildings. On the Georgian border, Camili is one place worth a visit, and the Coruh River provides some adrenaline-loaded activities. 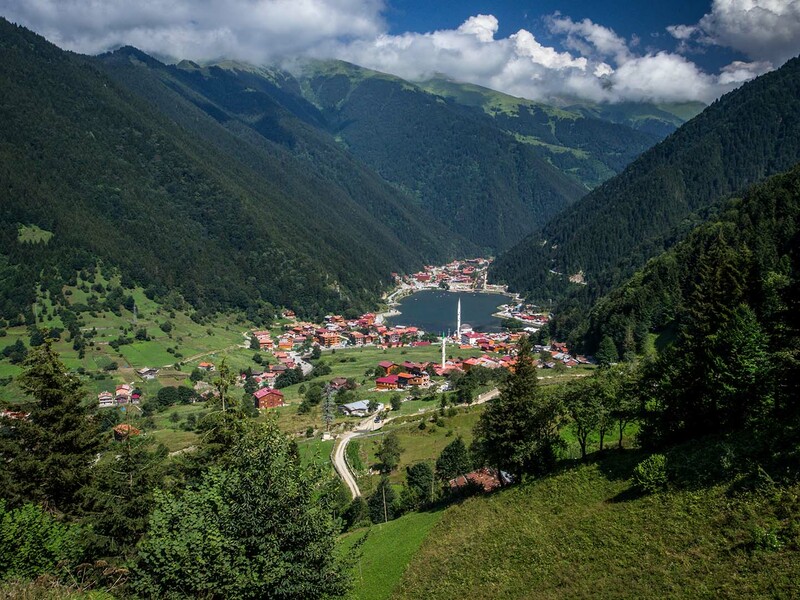 Artvin hosts many protected areas and Borcka and Karagol Lakes are famous worldwide. In addition, Cehennem Stream Canyon welcomes many trekking lovers every year.